Operation 'Dynamo', the code name for the evacuation of the Allied Service men and women from the beaches in the Dunkirk area of northern France in the late Spring of 1940. The operation took place between 26 May and 4 June 1940, during which time the 'Little Ships' of Dunkirk transported the service men and women of Britain, France and Belgium from the beaches to the mainly Royal Navy and Merchant Navy vessels lying offshore. Once on board, they were transported across the Channel to Britain. This was the legendary 'Miracle of Dunkirk'. Operation 'Dynamo' succeeded in evacuating about 368,000 troops. In addition to those evacuated from the Dunkirk area, more than 200,000 Allied troops were also evacuated from other ports, such as Cherbourg. On 4 June 1940, at the end of Operation 'Dynamo', the British Prime Minister Winston Churchill reported back to the House of Commons about the Dunkirk evacuation. It would become of his best remembered speeches.
" The British Empire and the French Republic, linked together in their cause and in their need, will defend to the death their native soil, aiding each other like good comrades to the utmost of their strength. Even though large tracts of Europe and many old and famous States have fallen or may fall into the grip of the Gestapo and all the odious apparatus of Nazi rule, we shall not flag or fail. It was at that moment that the term 'Dunkirk Spirit' entered the English language. It is synonymous with the refusal to accept defeat even in the a time of great crisis. Many of those saved would subsequently take part in operations in various parts of the world, helping to liberate North Africa, Europe, and the Far East. The Dunkirk Veterans Association was formed by a group of ex-servicemen who had served at Dunkirk in Leeds, West Yorkshire in 1953. The number of branches grew throughout Britain, the Commonwealth and elsewhere to more than 100, with more than 20,000 members. Due to the increasing average age of its active membership, the Association was voluntarily disbanded on 30 June 2000. The remainder of this article is mainly concerned with the West Cumbria Branch of the Dunkirk Veterans. "To assist all needy members and their families and to foster the spirit of comradeship which existed on and off the Dunkirk beaches in 1940". "All service personnel who served at Dunkirk and other ports of evacuation between 10 May and June 1940 have been eligible for membership, including all personnel of the British Expeditionary Force (B.E.F.) who were taken prisoner of war as a result of that 1940 campaign. Associate membership was also granted to those otherwise not qualified, but who had assisted at the ports of evacuation, during the relevant period". The West Cumbria Branch of the Association was based in the Whitehaven area but its membership also included former veterans living in other parts of Cumbria. 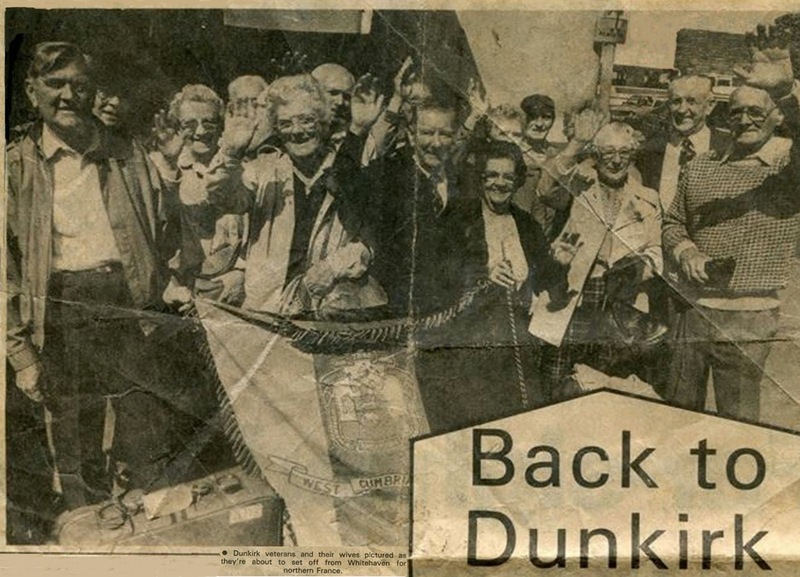 Members and their wives, families and supporters returned to the Dunkirk area several times for the anniversary of the evacuation. For example, the newspaper cutting from the 'News & Star' [Photograph No. 1, above] shows some of the West Cumbrian party immediately before the group left for Dunkirk. Seen at the front of this photograph is the West Cumbria Branch standard, which was subsequently laid up at the Whitehaven corps of the Salvation Army in 2000. During this pilgrimage to Dunkirk, and with the consent of the Dunkirk authorities, a small amount of sand from the beach at Dunkirk was brought back to West Cumbria. The sand and the names of the branch members were placed in a wooden casket, which was donated to the Parish of Whitehaven (Church of England) and placed beneath the St Nicholas parish WW2 War Memorial [Photograph No. 2]. On the handle of the wooden casket can be seen the badge of the Dunkirk Veterans Association [Photograph No. 3]. The wooden casket and war memorial are located in St Nicholas' Church Tower, Whitehaven [Photograph No. 4]. "This casket contains sand taken from the evacuation beaches of Dunkirk, which during May and June 1940, a total of 368,000 British and Allied servicemen were rescued from the might of the German Armed Forces by gallantry of the Royal Navy and other Small Ships. 'From glorious defeat grew the shoots of final victory'." "Presented to the Parish Church of Whitehaven by the West Cumbria Branch of the 1940 Dunkirk Veterans Association on the anniversary of the evacuation of Dunkirk". Below is a transcription of the list of members belonging to the West Cumbria Branch in 1988 / 1989 that was placed inside the wooden casket before it was presented to the Parish of Whitehaven. Those Dunkirk Veterans who did not join the Branch until after 1989 do not, therefore, appear in this list. Likewise, those Dunkirk Veterans living in West Cumbria who, for one reason or another, never joined the Association are not listed either. What did some of the Dunkirk Veterans think about before setting off to Dunkirk for the 50th anniversary commemorations of the historic evacuation? Some of the Veterans were interviewed by the reporter from the 'News & Star' (a local evening newspaper in West Cumbria). "We had marched 25 miles under attack all the time from air and ground. There were thousands lined up on the beaches waiting to get off. I'm not sure why, but thank God the Germans halted. They had us in the bag and it could have been a mass surrender if the evacuation hadn't succeeded." Later in the war, Sid Stanfield returned to N.W. Europe taking part in many more battles, including the Battle of the Bulge. John Lewthwaite of Kells, Whitehaven was another Dunkirk Veteran who returned to the area for the 50th anniversary. An enthusiastic amateur photographer, Mr Lewthwaite was hoping to shoot 15 rolls of film and show them to give a presentation at the Whitehaven Miners' Welfare to a local group of the University of the Third Age. Mr Robinson Hewer of Parton, Cumbria was thinking about two of his brothers, Ernest and John. Although Mr Hewer was one of those lucky enough to be evacuated in Operation 'Dynamo', his two brothers, Ernest and John Hewer were not so lucky and were captured by the Germans near Calais. Some of their friends and comrades who did not get evacuated from the Dunkirk beaches in 1940 paid the ultimate price with their lives and would never make it home. Thus, it was extremely important for the party of 48 from West Cumbria to remember their fallen comrades. John Lowrey from Whitehaven, who would later succeed Sid Stanfield as Branch Secretary, was thinking of these many young lads he had known in 1940. During the pilgrimage, John laid a wreath on behalf of the West Cumbria Branch at the main Dunkirk Memorial in the Dunkirk Town Cemetery. For the British troops who were at Dunkirk in May and June 1940 the memory of those days would always remain with them. That is why so many of the Veterans of Dunkirk, along with their family and friends, wished to return to Dunkirk on pilgrimage. Bad as things were in 1940 on the Dunkirk beaches those who survived always believed the fortunes of war would turn in their favour. Nor would they ever forget those who would never make it home. "Wars are not won by evacuations". As referred to earlier, all the Branch standards of the 1940 Dunkirk Veterans Association were laid up in June 2000, 60 years after the 'Miracle of Dunkirk'. However, it remains one of the most important and defining episodes of the Second World War. The town of Dunkirk was to remain in German hands for almost five years, even after most of France was liberated. In fact Dunkirk was the last town in France to be free of the German Occupation. "The years may have passed but the remembrance of those days will live on from one generation to the next." 'News & Star' (Cumberland Newspapers), Cumbria. (For information about his uncle, Mr Robinson Hewer). and Remembrance Memorial (Le Mémorial du Souvenir).